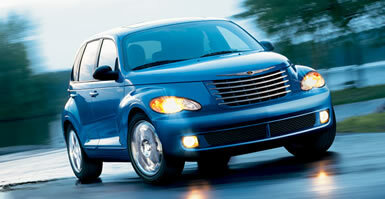 San Francisco: You'd be hard pressed to notice the difference, but Chrysler's PT Cruiser got a facelift for 2006. The new headlights look like a biology lesson on cell division, but the car remains unchanged in spirit. When Chrysler first started selling the PT Cruiser in 2000, it stood out like a clown at a funeral. You couldn't help but notice it. Today there are so many retro-themed cars for sale and so many other PTs on the road that they hardly get a second glance. We've grown accustomed to seeing cars like the Chevy HHR and SSR, Volkswagen Beetle, Ford Thunderbird and Mini Cooper, so it's like all our funerals have become filled with mourners dressed as clowns. Craziness has become fashionable, it seems. That's why I'm surprised Chrysler wasn't very bold when it redesigned the PT Cruiser for 2006, especially after seeing sales figures for the way-hot HHR - a car that's often dubbed the "me too" cruiser - because of its similarities to the Chrysler. Instead of adding some zest with a wild new look or attention-grabbing new features, the latest PT is only mildly changed and slightly better. It has a new interior - one that looks different but hardly functions any better than the old one - along with some baffling styling changes on the front end. The biggest improvement can't even be seen: more sound insulation that keeps the cabin quieter on the highway. The front-end style is the most difficult to fathom because the changes seem neither necessary nor particularly attractive. Chrysler designers gave the PT a new grille that looks good enough, but there was no compelling reason to replace the old one. It looked just fine. Same thing goes for the front fascia that surrounds the fog lights, which have inexplicably changed from oblong to round. Perhaps the most noticeable change is in the headlights, where a droopy, scalloped, two-part lamp replaces the simpler and more elegant cat's eye design. It looks like Chrysler bought a bunch of the droopy lights at a yard sale and then rigged up a way to stick 'em on the Cruiser. They don't seem to fit the character of the car. Inside, you'll find an attractive, all-new interior that looks nice enough, but it's hardly the step up in quality you'd expect from a company that also owns Mercedes. Aside from a hard plastic dash that feels like it's made from the same material as Bic pens, everything in the cabin looks like a nice, comfortable, slightly upscale car should. Which, come to think of it, is about how the old PT fared, too. Also like the older PTs, the new ones remain very affordable with prices starting at $13,405 and ranging up to $23,030 for the turbo GT model. A low price is something we like to see carried over from the old models. Two new improvements are quite noticeable, though. One is the amount of noise you hear while driving around, particularly at highway speed. Chrysler added more sound insulation to keep wind and road noise out of the cabin to make the PT sound more like a luxury car and less like a gussied-up Dodge Neon. The other improvement is a new turbocharged engine that makes 230 horsepower - a huge number for a relatively small car. In the PT Cruiser GT model I tested, which came with this high-output engine, I had no trouble spinning the tires from a dead stop with an automatic transmission. It's easy to let that amount of power sneak up and surprise you from time to time when you glance down at the speedometer and see you're breaking the law ... by a considerable margin. Other than that, it's the same old PT. The only question is whether that's enough to keep it a winner on the showroom floor.